You may notice an expansion of subject matter or a shift of tone in my blog over the next few weeks. In the interests of transparency, I’ll let you in on what’s up. 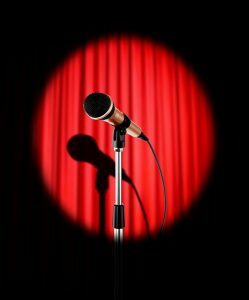 True to my curious nature, I signed up for a class for seniors, “Finding Your Funny – Discover Stand Up Comedy.” Oddly, and in line with how I’ve learned the universe works, I was looking for a different course when this one found me. It’s going to be good. Our instructor, Janice, is a stand-up comedian with lots of experience, both in the business and in teaching. She keeps a tight rein on things. She has to. She’s got 19 feisty seniors to wrangle. All of us have tons of life experience, aching to be shared and heard. The first class was on the morning of September 7th. Janice gave us lots of homework. She wants to drive home the point that one has to write tons of material to happen upon a few lines worth sharing. Firstly, we were supposed to spend twelve minutes writing all the thoughts that came into our heads, in longhand. True to my renegade nature, I started with the thing we were supposed to do secondly. That was to list five things that we find hard, five things we think are stupid, five things that scare us, five things that are weird. The first thing that came to mind under “hard” was doing the assignment. I’ll bet real money most of my classmates came up with that one, too. The third thing I need to do before the next class is to take a topic that emerged during the second exercise and come up with a punch line. That’s another big one for the “hard” category. This whole adventure is teaching me a lot about myself. Number one: I’m going to find it emotionally draining. I fell into bed and slept for two hours when I got home from the first class. Number two: It’s going to be emotionally fulfilling. Thinking about the homework assignments has made my internal dialogue more interesting. I was getting bored with the small talk about the weather or what to make for supper. If taking this class livens up my blog, that will be a bonus. This entry was posted in Writing and tagged course, homework, seniors, stand up comedy on September 12, 2017 by Wilda.